If you’re looking for a cafe that has both great food AND entertainment for the kids, look no further than this cafe on the waterfront in Petone. In the old rowing club building, the menu is stocked with all the popular breakfast staples including a full cooked breakfast, eggs benedict, pancakes and even non-egg options like avocado and tomato on toast. The kids menu includes a bowl of cocoa pops, plain boiled egg with soldiers as well as pancakes with different toppings. There are also lunch items on both menus and in the cabinet. The coffee is roasted onsite and also comes recommended, otherwise there are smoothies and shakes to choose from. While you’re waiting for your food, the kids have the option of exploring the range of games on offer. 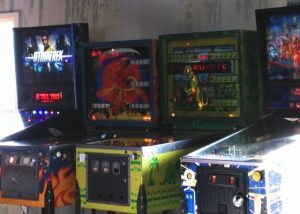 There are 4 different pinball type machines, a fusball table and a couple of ride on machines. All of these need money so TOP TIP: take some spare change with you – games range from 50c to $2! If on the off chance you’re not here with kids, you can sit at the other end of the cafe as far away from the pinball etc machines as possible, and enjoy the view over the harbour! This is a popular place to go out for breakfast at the weekend, it can pay to get there before everyone else arrives around 9 – 9.30am. In fact, if you have kids that get up early, it’s worth noting that they open at 7am! TOP TIP: if your kids need to get rid of some excess energy before or after your visit, take bikes, scooters, roller blades or just your legs to go along the path on the foreshore that this cafe sits right next to. Address: 160 The Esplanade, Petone. There’s a carpark just next to the cafe. Open: daily 7am – 5pm with late night openings on Friday and Saturday.